Now that patch v243 has finally hit our games, there is a lot of new stuff to discover. In this post we will walk you through the most important things and provide you with all the necessary information to enjoy it to the fullest! It seems that the Titanosaur cannot be tamed in a normal fashion. Instead, you’ll have to down it with brute force (real brute force, so cannon balls and ballista bolts to the face). It’s recommended that you bring a team, as it will not be possible to take it down on your own. After you’ve damaged it enough, it will go down and you will be able to put a saddle on his back. After that, it’s yours (temporarily though). We don’t know the exact time yet, but it seems that you can only keep the Titanosaur for about 24 hours (real time) or maybe slightly more. We’ll look into this further, but it’s suspected to be based on when the food hits zero (as you cannot feed it). 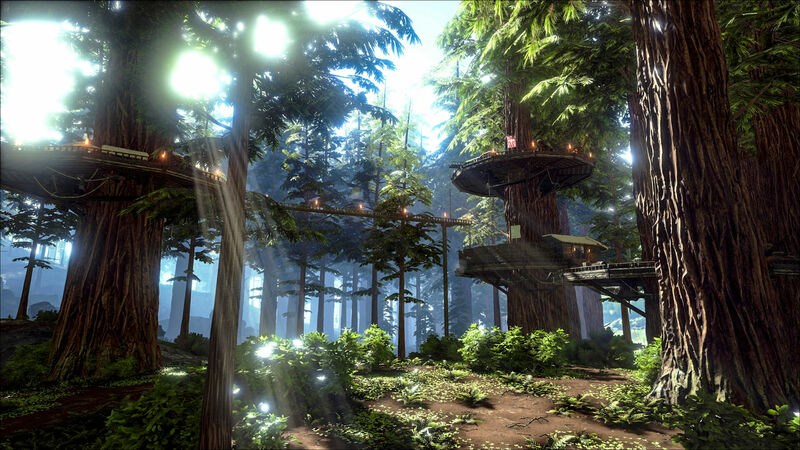 The Redwood biome can be found around the middle of the Island. Just go check it out, it’s awesome to see! 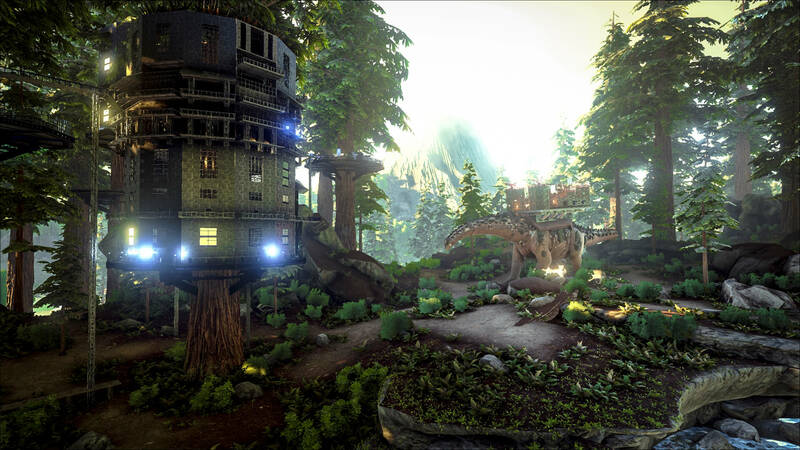 You can build in the trees and place a special treetrap to get sap from them (for instance used for the gasmask). Even the Titanosaur looks small compared to the size of these trees! The gas mask can be used to keep you save from toxic gasses and diseases. It’s very useful for the swamp cave and to counter the swamp fever. In order to “refill” the mask, you’ll need the new Sap that can be obtained from the Redwoods. You’ll need to be level 95 to learn the engram and it will costs you 110 EP. With the redwood trees comes also their sap. You can make a special tree sap tap to get sap from the redwood trees over time. For now the only use of the cakes is to make it possible to heal herbivores in an easy way (since berries don’t work well) and it doesn’t seem to be of use for taming. If you have found any other uses, please let us know in a comment! 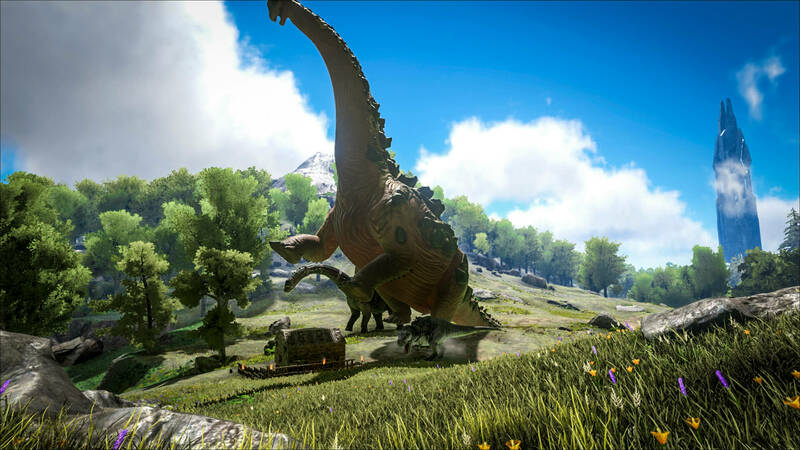 The ballista has been extended with a chain bola that you can use to bring down the larger creatures in ARK. This means that you can now take down big flyers such as the Quetzalcoatlus! Im guessing this update was on pc bot xbox? Titanosaur only for 24 hours? Any tips on building on tree platforms? So annoying! When are u guys going to make the Baryonyx? I’ve been waiting for sometime now. When does this update come out for xbox one? I’m not sure if this is intentional, but on xbox, I’m unable to land my Quetzal on my Titanosaur’s platform. I tried building some foundations, but I still couldn’t do it. Is this a bug or intentional? If it’s intentional then it’s pretty lame, because Quetz just gets stuck in the damn thing, even with the follow distance at its highest.